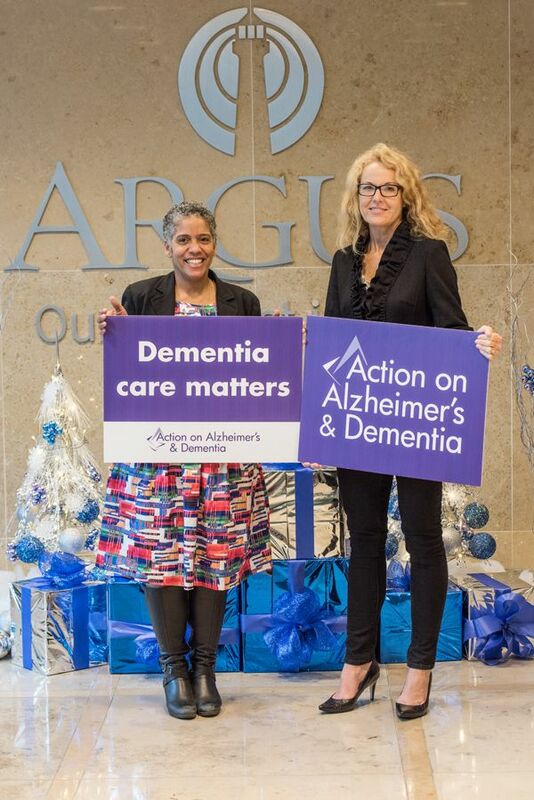 The Argus Group today [Dec 15] announced it has made a donation to Action on Alzheimer’s & Dementia [AAD], a local charity established in 2012 to raise awareness in the community and to give support to people in Bermuda living with dementia, along with their families and caregivers. AAD provides resources, emotional support – including monthly meetings for families – a comprehensive activities programme and services of an occupational therapist to help those with dementia. In addition, the charity provides education to medical professionals, caregivers, nursing homes and other health services in Bermuda. In part, the Argus donation will help fund the services of AAD’s occupational therapist. The service includes cognitive, functional and safety assessments, along with ‘person-centred’ care planning and ongoing monitoring that offer family caregivers insight into the individual’s specific needs, in an effort to improve all aspects of daily living. The donation will also assist with the funding of activities for people living with dementia and their families. Daily activities are organised at five locations across the Island, including at WindReach Recreational Village, and are specifically designed to benefit people living with dementia. In addition, the charity provides free dementia-specific training to businesses and their employees, nursing homes, private caregivers and in-home care providers to raise awareness and help support and improve the quality of care for persons living with dementia. Elizabeth Stewart, Founder and Board Chair of AAD, says: “We would like to thank Argus for its generous donation that will help improve the lives of individuals in Bermuda living with dementia. AAD estimates there are 1,000 people living with dementia in Bermuda. Approximately 60 per cent of this group would have Alzheimer’s disease as the underlying cause. Alzheimer’s is the most common form of dementia, a general term for a group of symptoms that are severe enough to interfere with daily life. A progressive disease that destroys areas of the brain, Alzheimer’s causes memory loss, confusion and eventual loss of speech, understanding and movement. The disease has no current cure, but there are treatments for symptoms, which, combined with supportive services, can make life better for those living with Alzheimer’s. Michelle Jackson, Executive Vice President, Group Insurance of the Argus Group, says: “Dementia not only impacts the person afflicted with the disease, but also affects the entire family. There is often a lack of awareness and understanding of dementia and Alzheimer’s, particularly when symptoms first occur and it can be overwhelming for families and caregivers. For more information about AAD, visit www.alzbermuda.com, email alzbermuda@yahoo.com or call 707-0600. Wonderful investment by Argus in our growing population of people impacted by Alzheimer’s & Dementia. Continued success to all involved in this important service to our community.